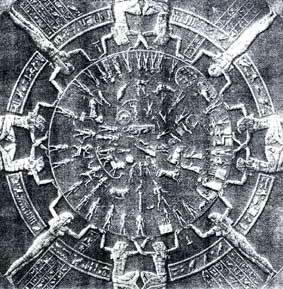 CALENDAR OF DENDERAH WITH HOUSES OF ZODIAC PORTRAYING LEO AT THE VERNAL EQUINOX. Because of precession of the equinoxes this calendar refers to a date of between 10,950 and 8800 B.C., 19 and corresponds to the period in which the Sphinx was eroded by water, the pyramids of Giza were built in perfect alignment with the constellation, Orion, and the mastodons and American horse and camel disappeared. It also corresponds to the date Atlantis was submerged.